Department of Pharmaceutical Sciences and Drug Research, Punjabi University, Patiala - 147002, Punjab, India. ABSTRACT: Introduction: Green leafy vegetables are known for their anti-alzheimer potential. There are many leafy vegetables, however, that have not been examined scientifically for this activity. The present study was designed to evaluate antioxidant and antiacetylcholinesterase activities of two Brassica species namely B. napus and B. oleracea var. acephala, along with the comparison of their pharmacognostic characters and phytochemical profiles. Methods: A comparative evaluation of macroscopy, microscopy, physico-chemical parameters and qualitative phytochemical screening was carried out on leaves of the selected plants as per Indian Pharmacopoeia. Further, a parallel analysis of antioxidant and anti-acetylcholinesterase activities of both species was done using DPPH and Ellman assay, respectively, followed by standardisation of the extracts on the basis of total phenol and total flavonoid content. Results: The hydromethanolic extract of B. oleracea var. acephala showed higher radical scavenging activity than that of B. napus. Similar results were obtained in case of total phenol content (B. oleracea var. acephala: 15.18 ± 1.82% w/w, B. napus: 12.69 ± 2.26% w/w). The hydromethanolic extract of B. napus showed higher acetylcholinesterase inhibitory activity than B. oleracea var. acephala. Conclusion: The pharmacognostic profiles of the two Brassica species generated in the present study could assist in proper identification, collection and investigation of the plant material in future. Both plants have good antioxidant effect but B. napus showed significant antiacetylcholinesterase activity and it could be investigated for anti-alzheimer potential. INTRODUCTION: Alzheimer’s disease (AD) is the most common cause of dementia leading to a slow progressive and irretrievable ruination of mental health 1. Modern treatment strategies comprise of anticholinesterases, antioxidants, α- and β-secretase inhibitors, N-methyl-D-aspartate receptor antagonists, etc. 2, 3. In light of side effects of current medications, there is an increasing trend to explore plants / phyto-constituents for management of dementia of alzheimer’s type. Literature shows that consumption of green leafy vegetables prevents the onset as well as progression of AD 4. Hence, in the present study anti- acetylcholinesterase and antioxidant potential of two common leafy vegetables namely B. napus and B. oleracea var. acephala (Family Brassicaceae) was examined. Further standardisation of the extracts was done on the basis of total phenol and total flavonoid contents. In spite of the numerous medicinal uses attributed to these Brassica species 5, 6, 7, 8, there are no records of pharmacognostic standards of these plants that are required for quality control of the crude drug. 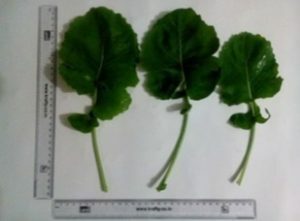 Hence, in the present study, a comparative evaluation of macroscopy, microscopy, physicochemical para-meters and qualitative phytochemical screening was also carried out on leaves of two Brassica species with a view to establish standards for their identity, quality, purity and chemical composition. Cultivation and Collection of Plant Material: Seeds of B. napus and B. oleracea var. acephala were procured from Green My Life Nursery (Receipt no: 4216) and sown in Punjabi University Patiala campus in last week of October 2014 and the leaves were collected during the month of January 2015. Macroscopic Evaluation: The various macro-scopic features of the fresh leaves like size and shape, colour, surfaces, venation, presence or absence of petiole, the apex, margin, base, lamina, texture, odour, taste etc. were evaluated 9, 10. Microscopic Evaluation: Transverse sections of fresh leaves and ground powders were observed under a microscope to determine the anatomical characteristics. Various tissues were distinguished by differential staining technique. Quantitative leaf microscopy to determine palisade ratio, stomatal number, stomatal index, vein-islet number and veinlet termination number was performed on the epidermal strips 9, 11. Physicochemical Evaluation: Various parameters i.e. foreign organic matter, moisture content, extractive values and ash values were evaluated for identity, purity and strength according to IP, 1997 12. All the readings were taken in triplicate. Chemicals: Acetylthiocholine iodide (ATCI), acetylcholinesterase (AChE) from electric eel (Type VI-S lyophilized powder), 5,5ʹ-dithiobis[2-nitrobenzoic acid] (DTNB) and 2,2-diphenyl-1-picrylhydrazyl (DPPH) were obtained from Sigma-Aldrich (Steinheim, Germany). All other chemicals, solvents and buffers were of analytical grade. Preparation of Extracts: Leaves were dried in shade and reduced to a coarse powder. Two extracts (viz. 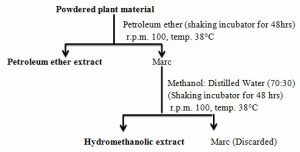 petroleum ether and hydromethanolic) were prepared from dried powdered plant material (150 g) by successive exhaustive extraction. Preparation of different extracts was done according to the given Scheme 1. Each extract was concentrated on rotatory vacuum evaporator. Extracts were weighed and percentage yield was calculated in terms of the air dried weight of the plant material. Phytochemical Evaluation: Extracts were subjected to various chemical tests to assay for the presence of phytoconstituents such as alkaloids, tannins, flavonoids, triterpenoids, sterols, saponins etc. using standard experimental procedures 10, 13, 14. Total Polyphenol Content Analysis: Total polyphenolic compounds of the hydromethanolic extracts were determined by Folin-Ciocalteau procedure 15. Analyses were run in triplicate. IC50 values were obtained by plotting the percentage inhibition against the extract concentrations. Statistics: The results have been expressed as mean ± standard deviation (SD). The test extracts were compared with standard drug by one way analysis of variance (ANOVA) followed by Student Newman Keul’s test as post hoc analysis. Macroscopic Evaluation: According to World Health Organization (WHO) the first step towards establishing the identity and purity of a medicinal plant is the macroscopic and microscopic evaluation. Organoleptic evaluation is a qualitative technique based on the study of morphological and sensory features of whole drugs 19. Various organoleptic features of the leaves of B. napus and B. oleracea var. acephala Fig. 1 and 2 were observed and results are presented below in Table 1. The findings are in accordance with the available literature but detailed examination regarding the macroscopic features of leaves of B. napus and B. oleracea var. acephala has not been carried out in the previous studies 20. Microscopic Evaluation: Microscopic evaluation is one of the simplest and cheapest methods to establish the identity of plant materials. It is mostly used for qualitative evaluation of organized crude drugs in entire and powder forms with help of microscope 11, 19, 21. The microscopic characters of the leaves of B. napus and B. oleracea var. acephala have not been evaluated to the best of our knowledge. Transverse Section of Leaves: Free hand sections of fresh leaves were cut and photographs were taken. The results are presented in Fig. 3 and 4. Determination of Leaf Constants: Leaf constants of both the plants were determined and results are presented in Table 2. Physicochemical Evaluation: The evaluation of physicochemical parameters helps to determine the identity, purity and quality. Extractive values give an idea about the nature of the chemical constituents present in the plant material. Since the water soluble extractive value was found to be higher than ethanol soluble extractives in both the plants, this indicates that the concentration of polar compounds may be high in B. napus and B. oleracea var. acephala. Ash content of a drug provides information regarding various impurities like carbonates, oxalates and silicates present in the plant material 11, 20, 22. The water soluble ash provides information about the amount of inorganic compounds present in herbal drugs while acid insoluble ash gives an idea about the amount of silica present in the form of earthy matter 23. The results of this study Table 3 reveal a high level of ash values, foreign matter and moisture content in case of B. oleracea var. acephala while B. napus has higher values of water soluble and ethanol soluble extractives. Preparation of Extracts: Petroleum ether and hydromethanolic (70:30) extracts of B. oleracea var. acephala and B. napus were prepared. Following yields of extracts were obtained Table 4. Phytochemical Screening: The results of phytochemical screening of the prepared extracts are given in Table 5. The results revealed some differences in the constituents of the two species studied. The results are in accordance with the earlier reports 24, 25. Antioxidant Activity: The free radical scavenging activities of the plant extracts were assessed by DPPH assay Table 6. DPPH free radical method is an easy, rapid and sensitive way to explore the antioxidant potential of plant extracts 17. The hydromethanolic extracts have higher radical scavenging activities than petroleum ether extracts. Hence these were investigated further. Estimation of Phenol and Flavonoid Content in Hydromethanolic Extracts: The total phenol and flavonoid content of all the plant extracts are shown in Table 7. Hydromethanolic extract of B. oleracea var. acephala has higher total phenolic content in comparison with B. napus extract. In-vitro Acetylcholinesterase Inhibitory Activity: Acetylcholinesterase inhibitory activity of the hydromethanolic extracts of B. napus and B. oleracea var. acephala was analysed by Ellman method using donepezil as a standard Table 8.
n=3. The data was expressed as Mean ± S.D. ; *p<0.05 vs. donepezil; one way ANOVA followed by Student Newman Keul’s test. 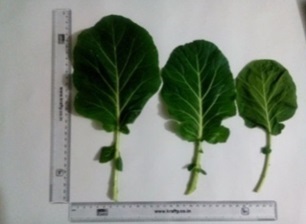 Amongst the two plants, the hydromethanolic extract of Brassica napus showed higher activity (indicated by lower IC50 values) than B. oleracea var. acephala. CONCLUSION: B. napus and B. oleracea var. acephala have high culinary value and are known to have wide array of pharmacological activities. The results of the pharmacognostic evaluation in the present study could assist in proper identification, collection and investigation of the plant material in future. The present study shows that hydro-methanolic extracts of both species have antioxidant and acetylcholinesterase inhibitory activity. Of the two species B. napus showed marked acetyl-cholinesterase inhibitory activity and it could be investigated for anti-alzheimer potential. ACKNOWLEDGEMENT: This study was sponsored by University Grants Commission (UGC) (under UGC-BSR scheme, Award no. F.4.25-1/2013-14(BSR)/7-265/2009(BSR)). The authors are thankful to the Department of Pharmaceutical Sciences and Drug Research, Punjabi University, Patiala, India for providing the necessary laboratory facilities for this work. Brookmeyer R, Johnson E, Graham KZ and Arrighi M: Forecasting the global burden of alzheimer’s disease. Alzheimer’s and Dementia 2007; 3: 186-191. Wilkinson DG, Francia PT, Schwam E and Parrish JP: Cholinesterase inhibitors used in the treatment of alzheimer’s disease: The relationship between pharmacological effects and clinical efficacy. Drugs Aging 2004; 21: 453-478. Akhondzadeh S and Abbasi SH: Herbal medicine in the treatment of Alzheimer's disease. American Journal of Alzheimer’s Disease and Other Dementias 2006; 21: 113-118. Howes MJR and Houghton PJ: Plants used in Chinese and Indian Traditional Medicine for improvement of memory and cognitive function. Pharmacology, Biochemistry and Behaviour 2003; 75: 513-527. Han HY, Shan S, Zhang X, Wang NL, Lu XP and Yao XS: Down-regulation of prostate specific antigen in LNCaP cells by flavonoids from the pollen of Brassica napus Phytomedicine 2007; 14(5): 338-343. Attorri L, Biase AD, Benedetto RD, Rigato P, Virgilio AD and Salvati S: Micronutrient-enriched rapeseed oils reduce cardiovascular disease risk factors in rats fed a high-fat diet. Atherosclerosis 2010; 213(2): 422-428. Ayaz FA, Hayirlioglu-Ayaz S, Alpay-Karaoglu S, Gruz J, Valentova K, Ulrichova J and Strnad M: Phenolic acid contents of kale (Brassica oleracea var. acephala DC.) extracts and their antioxidant and antibacterial activities. Food Chemistry 2008; 107: 19-25. Wallis TE: Textbook of pharmacognosy. CBS publishers and distributors, 1985. Evans WC: Trease and Evans Pharmacognosy. W.B. Saunders Publication, Edinburgh, Edition 15th. 2002. Evans WC: Trease and Evans Pharmacognosy. Rajkamal Electric Press, New Delhi, India, 2007: 513-547. Indian Pharmacopoeia Commission, Indian Pharma-copoeia I. Government of India, New Delhi, 1997. Evans DA, Funkenstein HH and Albert MS: Prevalence of alzheimer’s disease in a community population of older persons. Jour of Amer Med Assoc 1989; 262: 2551-2556. Harborne JB: Phytochemical methods. A guide to modern technique of plant analysis. Chapman and Hill, London, 1992: 279. Madaan R, Bansal G, Kumar S and Sharma A: Estimation of total phenols and flavonoids in extracts of Actaea spicata roots and antioxidant activity studies. Indian Journal of Pharmaceutical Sciences 2011; 73: 666-669. Brand-Williams W, Cuvelier ME and Berset C: Use of free radical method to evaluate antioxidant activity. Lebensm Wiss Technology 1995; 28: 25-30. Blois MS: Antioxidant determinations by the use of a stable free radical. Nature 1958; 29: 1199-1200. Ellman GL, Courtney KD, Andres V and Featherstone RM: A new and rapid colorimetric determination of acetylcholinesterase activity. Biochemical Pharmacology 1961; 7: 88-95.
WHO: Guidelines for the Assessment of Herbal Medicines. WHO Technical Report Series, No. 863. World Health Organization, Geneva, 1996. Kokate CK, Purohit AP and Gokhale SP: Pharmacognosy. Nirali Prakshan, Edition 31st, 2005: 97-131. Duke JA: Handbook of Energy Crops, 1983 (e-book). Kumar S, Kumar V and Prakash OM: Pharmacognostic study and anti-inflammatory activity of Callistemon lanceolatus Asian Pacific Journal of Tropical Biomedicine 2011; 1(3): 177-181. Thomas S, Patil DA, Patil AG and Chandra N: Pharmacognostic evaluation and physicochemical analysis of Averrhoa carambola Fruit. Journal of Herbal Medicine and Toxicology 2008; 2(2): 51-54. Velasco P, Francisco M, Moreno DA, Ferreres F, García-Viguera C and Cartea ME: Phytochemical fingerprinting of vegetable Brassica oleracea and Brassica napus by simultaneous identification of glucosinolates and phenolics. Phytochemical Analysis 2010; 1259. Chopra RN, Nayar SL, Chopra IC, Asolkar LV and Kakkar KK:Glossary of Indian Medicinal Plants, New Delhi: Council of Scientific & Industrial Research 1956. Kaur S and Shri R: Comparative study of pharmacognostic parameters, antioxidant and anticholinesterase potential of Brassica napus and Brassica oleracea var. acephala. Int J Pharm Sci & Res 2019; 9(9): 3718-24. doi: 10.13040/IJPSR.0975-8232.9(9).3718-24. Authors Address: Department of Pharmaceutical Sciences and Drug Research, Punjabi University, Patiala, Punjab, India.